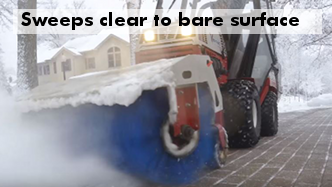 It clears snow and ice down to the pavement. 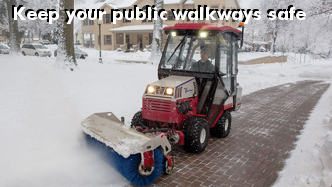 This keeps your sidewalks safe and minimizes the need for costly chemicals. Ease of operation. Most brooms this size are chain driven, but not the hydraulic HB580. 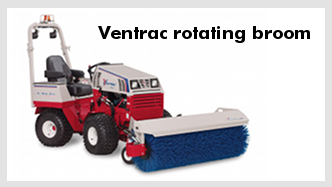 You can adjust broom speed, reverse the rotation direction, change the angle left or right, or lift it up and down right from the tractor seat. It’s super easy to attach and un-attach. 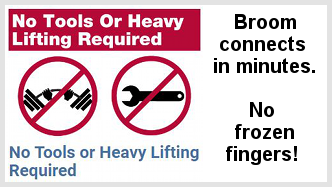 This means your operators won’t freeze their fingers off if there’s a need to change to a plow or a blower. 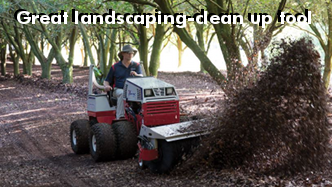 Designed for use with the Ventrac 4500 tractor, the HB580 power broom sweeps and removes snow, leaves, dirt, light gravel, and even thatch. A corner-less frame design permits sweeping against curbs and allows for the cleaning of corners. 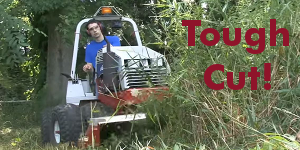 Simple controls located at the operator’s seat allow the broom to be hydraulically angled left or right or lifted up or down. 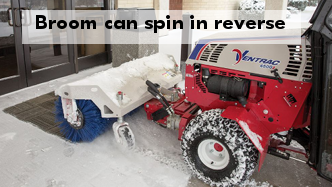 Add the optional electric actuator and you can adjust the broom’s rotation speed and direction (forward or reverse) – again, right from the seat. The broom stands alone when detached and is easily reattached. 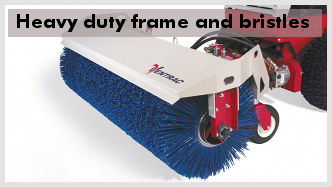 A self-leveling feature keeps the broom horizontal at all times and the nylon bristle broom cores can be changed in just a few minutes.